Made from a durable cotton exterior with reinforced utility pockets and waffle-weave polyester lining to withstand tough outdoor conditions. Hood will fit under a hard hat and there is an integrated cell phone pocket. 3 sewn-in carbon fibre heating zones that distribute heat to core body areas. Easy touch heat controller provides 3 heat settings: high, medium and low. 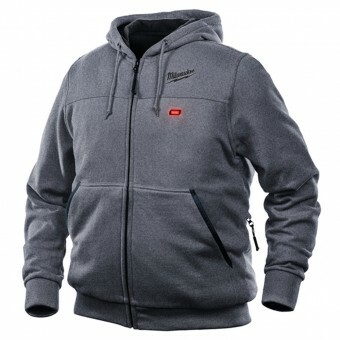 In autumn and spring the hoody can be worn as a rugged outer layer. In winter, it is best as a base layer that allows you to shed bulky undergarments while generating and holding heat close to the body. M12™ battery controller is stored in a concealed battery pocket for increased comfort and convenience. A single battery charge of a M12™ REDLITHIUM-ION™ 2.0 Ah battery pack (NOT SUPPLIED) will provide up to 8 hours of heat. Battery and charger are sold separately, NOT supplied.